The Bruna Wavy Cuff is a fabulous sterling silver cuff that features two rounded silver strands that cross over a highly polished sterling silver ribbon. 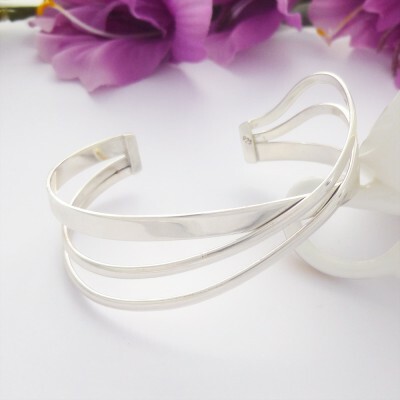 If you are looking for an elegant 925 sterling silver cuff that has that beautiful understated wow factor, then you will love the Bruna Narrow Wavy Cuff. 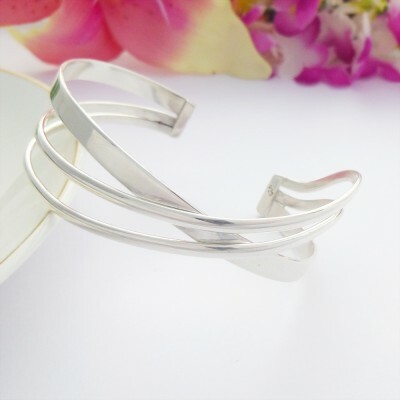 This is a cuff that you will enjoy wearing and it is the perfect gift for any woman who loves sterling silver bangles. The Bruna Cuff has an internal diameter of 65mm and it measures 22mm at the widest point. 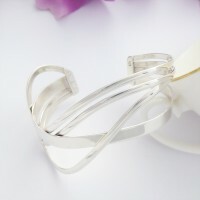 This bangle is made out of quality 925 Sterling Silver. It measures approximately 65mm in diameter and 22mm at its widest point. A sterling silver open cuff bangle with a wavy cross over effect. We offer a free 'Special Delivery' or 'First Class Signed For' delivery service through Royal Mail for all UK and Ireland orders. All orders are usually dispatched the day after purchase excluding weekends. During busy periods, it may be slightly longer, if you need your order quickly, just let us know and we will do our best! The same free UK and Ireland delivery service applies to all personalised engraved bangles, however, we ask you to allow up to 5 working days for your order to arrive. If you need any assistance with placing an order, or have any questions about any of our bangles or delivery needs, please call Guilty on 01271 814966, we are more than happy to help you!